“Let’s meet in Sanlitun,” my friends suggest. This should be easy, I had lived in that area during a previous stay in Beijing. The plan is to spend an all-American evening, the day of my arrival after all is July 4th – and we are meeting at a place called Union Bar and Grill. This sounds normal: Sanlitun has always been a central nightlife location for foreigners in Beijing. But when I get there I can’t believe my eyes. Of course, I have heard that the area has become “more upscale” lately, and I remember when the first bulldozers came in 2005 to tear down the row of bars that used to line this street. 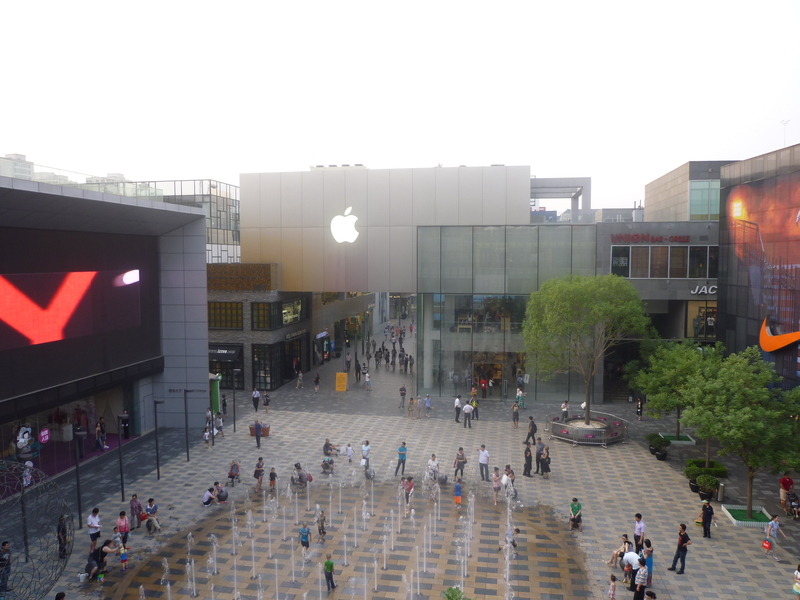 Now is my chance to see what “upscale” means in today’s China: “Sanlitun Village” is a Singapore style labyrinth restaurants and flagship stores of all the major global brands. I climb to the third floor of the shiny black Adidas cube to take in the scenery: An artificial square framed by a huge video screen and more stores on each of the other three sides. On the opposite side of the skywalk, I spot the sign for Union Bar and Grill. This is what progress looks like, I suppose, but I am still a little sad when I think of the “Bar Street” of the past. I would like to find out which of the side streets and old places I used to know still exist. My chance for this comes sooner than expected. “Let’s meet for lunch in Sanlitun,” another friend suggests the following day. After a light French lunch, I decide to stroll through the neighborhood. I am looking for a Chinese phone card, but I am also searching for a lost world. I walk past a huge Reiss London store (the chain that just closed in Georgetown because they could no longer afford the rent), past Armani and Jean-Paul Balmain. And then I leave the fenced-off area of the “village”, diving into a smelly, dirty Beijing back street, where groups of old men sit on little stools and drink tea out of greasy glas jars. I take a deep breath. There, in the background, I can see the Yashow department store. I walk over to check if they still sell all those fake Northface jackets and Burberry coats. Result positive. Some things never change. Back to the phone card project. The first vendor charges 150 Yuan for a card that comes with a credit worth of 30. The second vendor offers the same card for 40 Yuan. I give him the money and break the SIM card out of its plastic frame. Then I notice that someone has already rubbed off the silver coating from the pin code. The kiosk owner assures me that this is not a problem. I have my doubts, and when I dial the phone company’s number to pay the usage fee of five Yuan, the code is invalid. The vendor’s son tries it and comes back with more bad news: Not only is the pin code invalid, there also isn’t any credit on the card. The shop owner was duped by his supplier. He looks despondent as he hands me back my 40 yuan. Not only foreigners get cheated in China. The woman in the next store knows how to win a customer’s trust. She inserts a brand new card into my phone and dials the company’s hotline to confirm the credit. Having completed my mission, I decide that I need a cup of coffee at the Starbucks below the big video screen. Now I know that the old Sanlitun still exists. It is still possible to spend a whole afternoon trying to buy a phone card that is not a fake. Looking up at the shiny black Adidas store, I understand why people are willing to pay the real price for real things – and why they might actually like the new Sanlitun.